It often seems as though the romance genre has gotten a bad reputation as being merely “fluff” and lacking substance. Many romance novels are considered pure entertainment reading only; in other words, there is nothing between the book’s covers that could possibly educate, enlighten, or challenge the reader in any way. Don’t get me wrong– there are romance novels out there that probably fit this description, but isn’t that also true of any genre? Why is it that people automatically assume that romance novels are insubstantial? Why do people think that love stories must be fluffy? This question popped into my mind while reading Thomas Hardy’s classic novel Far From the Madding Crowd, which is generally regarded as a stereotypical romance in the public eye. Such a reputation was exacerbated by the recent movie adaptation starring Carey Mulligan. Because details from the book had to be left out in order to keep the movie at a reasonable length, it primarily focuses on the tumultuous “love square” between Bathsheba, Gabriel Oak, Mr. Boldwood, and Sergeant Troy. Though the romance is a large part of the novel– one could argue that it is the main point of the story altogether– it is more of a vehicle for promoting further discussion rather than the final destination. Whether or not it was originally intended by Hardy, the romance in this novel makes way for fascinating social commentary on the time period. We see the ways in which socioeconomic status and gender impact each other as well as how these factors impact relationships, marriage, and social life in general. The plight of Bathsheba also reveals the frustrating expectations that people held of women in both the workplace and the home. The specific relationships that Bathsheba forms with these men each provide an important and interesting look into society during this time period. Socioeconomic status is an obvious complication in the relationship between Bathsheba and Oak. Because Bathsheba is of a higher status than the poorer farmer, he is not a priority for her when it comes to entering a serious relationship. Later on she has the opposite problem with Mr. Boldwood, who is regarded as a worthy gentleman and praised by all who meet him. Many people encourage her to marry him because it would be a suitable match based on social status; however, a problem arises when she falls in love with Sergeant Troy instead. Here we clearly see the expectations of women in marriage, for Bathsheba is soon limited in her role as head of the farm when her relationship with Troy becomes more serious. It is expected that the man of house will control all aspects of the business despite the fact that in this case Bathsheba is actually much more skilled and knowledgeable than her male companion. Far from the Madding Crowd is just one example of how the romance genre surpasses the limited boundaries set by the deceiving stereotype often associated with such books. This classic novel made me realize that not all love stories must be fluffy in order to be captivating, entertaining, and enjoyable to read. What are your thoughts on this topic? How do you feel about the romance genre? 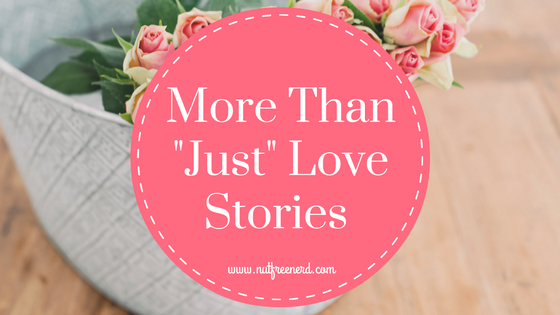 Have you read any love stories that defy the stereotype of the “fluffy” romance novel? Let me know in the comments section below! I think love stories in classics are more enjoyable for me. The fluffy style kind of bores me and is definitely not my thing. Outlander by Diana Gabaldon. My absolute favourite. I don’t tend to read contemporary love stories, but I really don’t get why love stories get a bad rep. Like…so many people see love as such a massively important thing in life, so why is it seen as fluff in a book? I haven’t read this Hardy novel, though I’ve loved the others of his I’ve read, which also tackled love in social and political ways. I think the classics generally do a good amount of tackling love in less fluffy ways, but it’s less recognized today. For instance, a podcast I was listening to recently bemoaned that many people forget Pride & Prejudice isn’t supposed to be fluff…it’s supposed to be a satire of all of the fluff, a point which is sometimes lost in the modern world. In short, I agree with you that romance gets a bad rap, which it doesn’t quite deserve. Great post! I actually really enjoy love stories. (My mother believes this is because of my raging hormones, but whatever). I think that often the nature of relationships in any good romance should say something about society. So I guess I like romance when it’s part of the story but actually says something as opposed to ‘OMG ROMANCE=PLOT FLUFF FLUFF ❤ ❤ <3' (if this makes any sense). Great discussion! I think the bad rep comes from the large selection of actually not that great romance novels that are just put out there as quickly as possible to make a profit. However, a well written romance, with good dialogue, plot, theme, and characters, can be just as good if not better than any other. Romance for the sake of romance is unenlightening fluff, even if it’s entertaining. Classics like P&P use romance to convey a social concept, making it enlightening. Romance as a plot point is also not fluff because it advances the story. Useless romance is useless fluff that gains importance if it ceases to be useless.